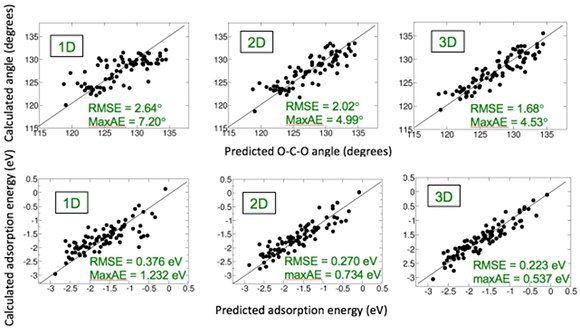 Figure 1: Comparison of predicted and calculated O-C-O angle and adsorption energy for CO2 adsorbed at about 140 different binary and ternary oxide surfaces. The predicted values are from descriptors obtained with a compressed sensing approach SIS+l0. Results for one-dimensional (1D), two-dimensional (2D), and three-dimensional (3D) descriptors are shown, as well as maximum absolute (MaxAE) and root mean square (RMSE) errors. Extensive release of carbon dioxide (CO2), originating from various industries (e.g. cement, steel, etc.) and transportation, into the atmosphere threatens to shift the balance of the CO2 cycle of the planet. However, instead of polluting the atmosphere and oceans, it is indeed possible to convert CO2 into hydrocarbon fuels or other important chemicals. CO2 is a nonpolar, stable molecule with two double-bonds. Therefore, it requires activation prior to reacting with other species. CO2 can be activated by adsorption at a solid-state surface. The molecule bonds with the surface, and this makes it easier to break the C=O double bond. This is a key first step for a subsequent catalytic reaction. However, not all materials are good catalysts for CO2 activation. Companies, for example the Spanish i-deals.es and Shell, are looking for better catalysts. But how can we find the best catalyst among billions of possible candidates? NOMAD data analytics and visualization tools help to answer this question. We identify descriptive parameters (descriptors) that are much easier to calculate than target properties (O-C-O bending angle or CO2 adsorption energy), but correlate well with the properties. The descriptors are identified using the compressed sensing approach SIS+l0 developed for NOMAD. This approach allows to systematically improve the accuracy of the prediction by increasing the dimensionality of the descriptor. Figure 1 shows the correlation between the predicted and the target properties, and the errors of the prediction. In order to better understand the physical meaning of the descriptors, the evolution of the electron density as the CO2 molecule approaches a surface is analyzed using NOMAD visualization tools. Click Figure 2 to view a movie created with the visualization tools. The movie gives a tutorial explanation of the interaction of CO2 with a surface.